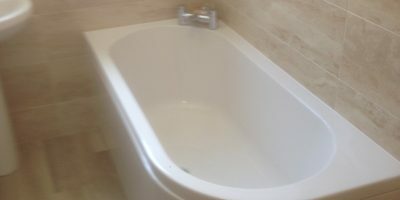 We were asked to turn a small family bathroom into a walk in shower room. Working closely with the client we were able to turn the brief into a very stylish but tranquil space. Wow! What a project this was. Our clients had a dream in mind and we believe that we have delivered this and more. 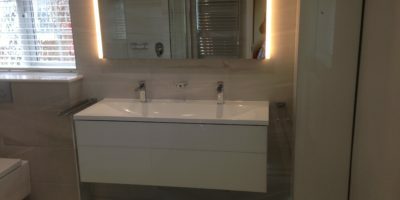 A thoroughly contemporary room, which featured underfloor heating, feature tiling, roll top bath, floating twin basins & units, wet floor walk in shower, back to the wall WC with concealed cistern. We were asked to create a modern look with a vintage feel. 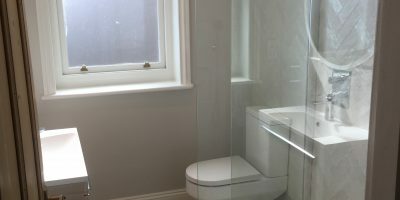 This was achieved by listening to our clients brief and offering our expert knowledge to come up with solutions and ideas to help our client realise their perfect family bathroom. 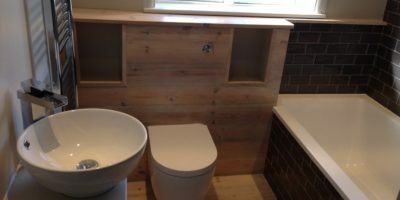 A complete redesign of a family bathroom, laying a new floor and boxing in the cistern using reclaimed wood. 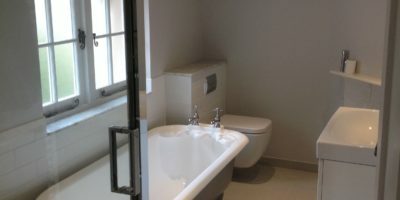 The clients own piece of furniture was modified to house the basin and tap. 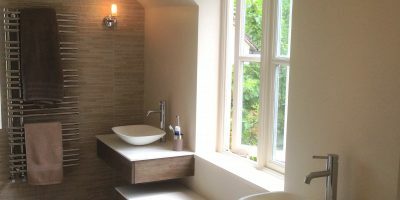 A quite old fashioned en suite was turned into a luxurious spa style room. With marble tops, porcelain tiles, mood lighting, german glass fronted furniture and as always great care & attention to detail.